Sawamura is a lonely, violent individual who had gone through a very painful childhood. As a child, his stepfather was an alcoholic who regularly physically abused Ryuuhei and his mother, and eventually the child Ryuuhei stabbed his stepfather with a knife in order to protect his mother. Soon afterwards, his mother places him in the care of the state while telling him she is looking for a job, when in reality, he is being abandoned by his mother as well (something that takes Ryuuhei 3 years to realize). His isolation and bitterness is only amplified when he is falsely condemned for killing doves that he had fed. His only friends are his old teacher from middle school and Sendou Takeshi, though he treats neither of them as such. Sawamura is a boxer and counter-punch user who is naturally talented, but likes to cause his opponents pain in the ring, which often disqualifies him. He was the former JBC Junior Lightweight Champion and has since retired from boxing. 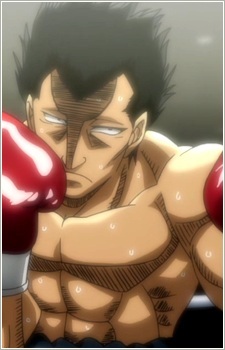 His main fights in the series are against Makunouchi Ippo and Mashiba Ryou. Mashiba challenges him to a title match because Sawamura had attacked his sister prior to the Ippo match. After he wins his fight against Mashiba (due to the fact that Mashiba was disqualified), he refuses to accept the belt, and instead rides away on his motorcycle. However, due to the massive head damage he suffered during the fight, he accidentally rides straight into oncoming traffic. His injuries are so bad that he is forced to retire from boxing forever.